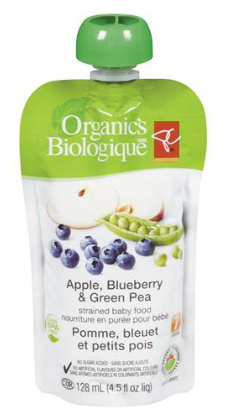 An undisclosed number of illnesses in Canada have been linked to PC Organics brand baby food, spurring Loblaw Companies Ltd. to expand its Feb. 3 recall to include 31 more products because of risk of botulism poisoning. For a list of all 32 baby food products recalled, as well as photos of the recalled products, click on the image. “A manufacturing error resulted in excess water in the product, which under certain circumstances could support the growth of Clostridium botulinum and pose a health risk to consumers. Consumers should not consume the recalled products,” according to the expanded recall notice posted Thursday evening on the Canadian Food Inspection Agency website. The nationwide recall includes several flavors of strained, pureed and smoothie baby foods in pouches packaged under the President’s Choice, or PC Organics label. Retailers sold the products through Thursday. There is concern consumers may still have the recalled products in their homes because of their relatively log shelf life and the sales that were ongoing through Thursday. The Feb. 3 recall included only this apple, blueberry, green pea flavor. Thursday, 31 more products were added to the recall. Click on the image to see the complete list and photos. “Check to see if you have the recalled product in your home. Recalled product should be thrown out or returned to the store where it was purchased,” the government recall notice states. West — Extra Foods, Loblaws City Market, No Frills, Real Canadian Superstore, Real Canadian Wholesale Club, Your Independent Grocer, Shoppers Drug Mart, and affiliated independent stores. Consumers with questions can contact Loblaw Companies Ltd. toll-free by calling 888-495-5111 or by sending email to customerservice@presidentschoice.ca.